Battery Charger / Maintainer BC 0.8 The BC 0.8 is a compact and fully automatic 6-step charger for 12V batteries from 1.2-32Ah and is suitable for maintenance charging up to 100Ah. The unique display allows the user to follow the entire charging process. 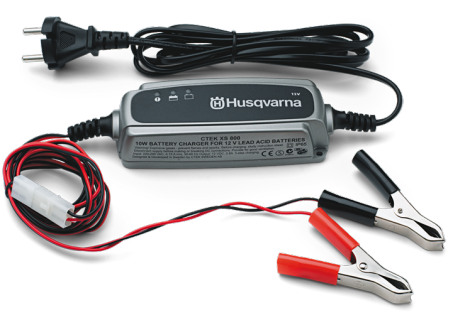 The user friendly quick connect on the end of the charger is designed to directly plug into the CTEK charging port found on select Husqvarna tractor models. The quick connect adapter also connects to the Comfort Connect Clamp (pictured) and Comfort Connect M6 eyelet (pictured), which can be used with any smaller 12V battery. Additional applications include: ATVs, motorcycles, snowmobiles, scooters, and jet skis. Features: • Maximizes battery life and performance • No sparks, short-circuit proof, and reverse-polarity protected for untroubled usage (splash & dust proof) • Five year warranty • Includes: Charging unit, Comfort Connect Clamp, Comfort Connect M6 eyelet, and Storage Bag.